Building your own personal backyard ice rink is great way to get your family outside having a blast during the cold winter months. A properly built ice rink kit will bring you joy and the dreaded winter months will soon become your best friend. If you take the proper approach, this is an easy project that will become a tradition and passion for your family for many years to come. WARNING...if you take the wrong approach, you will miss out on an awesome family tradition. We are the experts for backyard rink building and backyard rink products. The experience of building a rink is well worth the effort as long as you approach the task with the knowledge that Iron Sleek has gained through utilizing our specifically engineered backyard rink products. DO NOT JUST WING IT with compromised products that could be bought at a hardware store or by following a blog that you read on the web. Tap into our knowledge and our trusted engineered products. Our products are patented and are exactly designed for natural outdoor rinks. Skip the second guessing and the frustration by tackling the challenge before you with an Iron Sleek ice rink kit. Let us be your backyard rink teammate. Iron Sleek will save you time and money. Our ice rink kits are loaded with discounts! Our kits contain everything you need to get started: hardware, our patented side support brackets, corner bracing, liners and a 24 hour rink consultant. We provide everything unique to rinks while your job will be to choose the correct kit and to buy the lumber for your side boards at a local material supply store (for those who want something more elaborate, we offer Iron Sleek Poly-Steel Boards kits)! You won't have to search high and low for exact components that are so simple too use while still being tough enough to stand up to frigid conditions and repeated slap shots. Building your own backyard ice rink has never been easier! A backyard kit is a great starting point for a backyard rink rookie. Check out our rink gallery to see how some of our rink customers have taken a kit to become the most customized ice rink of their& imaginations. We can even help out to the point of providing you a detailed rink map. If this is your first time building a backyard ice rink, kits from Iron Sleek eliminate much of the confusion. Watch this step by step DIY rink video to see a basic rink kit install. Installing a backyard rink is as easy as choosing the rink size that matches your available space and verifying that the site is level within 12". 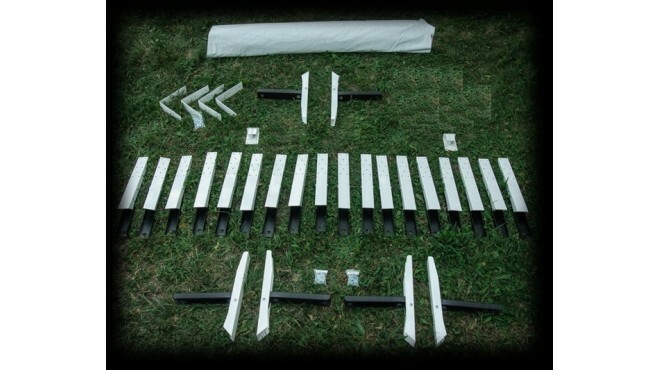 Instead of taking measurements and doing calculations to figure out how many brackets and related hardware is needed, just choose from one of our backyard rink kits below. You are guaranteed to have all the support you need to get your frame up - delivered right to your door! 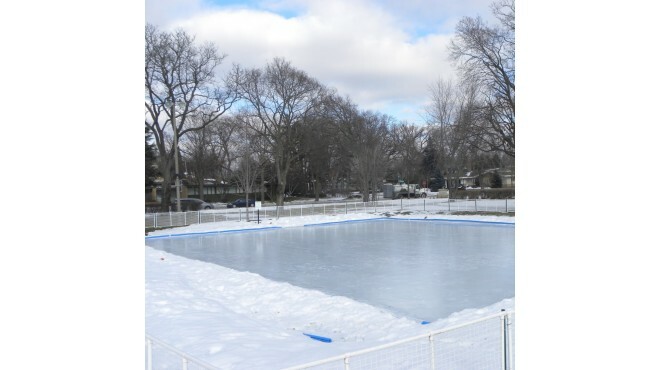 For highly pitched sites, over 12" of water, give us a call to discuss your rink plan and how to best utilize your kit. Iron Sleek backyard hockey rink kits equal BIG savings over buying individual components and are a great option to get you started building a rink for the first time. We offer over 50 different easy set-up backyard rink kits of various sizes. If we do not have your exact size, be sure to give us a call as we will extend the savings to even a custom ice rink kit. If you want to upgrade your skating rink to a hockey rink or an arena style rink, a starter kit is still a great starting point and we can add on from there. Also notice that kits have add on features such as topper, rink rounds brackets, and a resurface. When you buy a kit from Iron Sleek, all add-ons have free shipping and resurfacers are 10% off. Our smaller all-in-one starter backyard hockey rink kits ship in a single box to your home for easy set up. Larger residential backyard rink kits are also available. These backyard ice rink kits are up to 50' wide and ship to your doorstep in multiple boxes. Finally, for huge rinks, the Parks and Recs section has bigger and more accessorized rink packages. These large rink kits are also available to homeowners. Our packages are portable meaning your ice rink can be easily stored, expanded on, or moved to a new site in the future. 24" by 3/4 thick plywood boards are great for a hockey rink too but a plywood rink will require more brackets than are provided in our backyard rink kits. If you are building a plywood rink, please let us know. For plywood, figure a minimum bracket spacing of every 4 feet to compensate for the flex in the boards. When choosing among the different sized backyard hockey rink kits, keep in mind that your rink does not need to be the exact size of the kits listed below. You just need to make sure that you choose a kit that has a big enough liner. 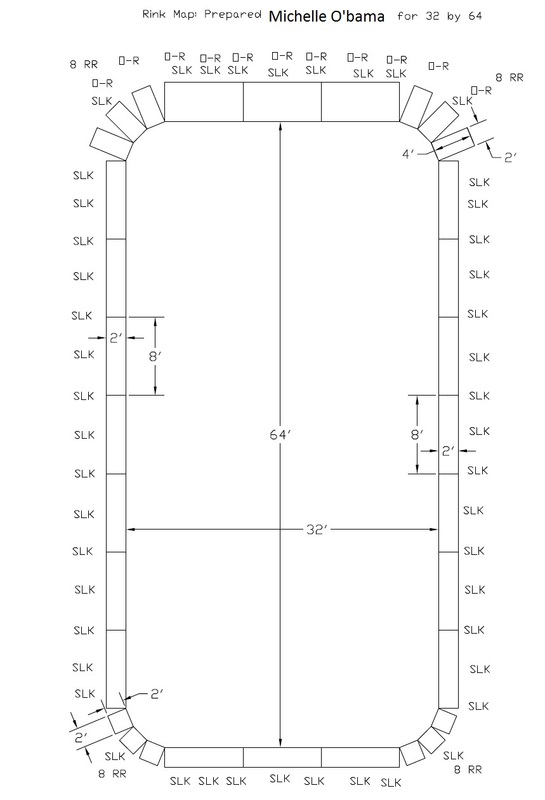 For example if you want to build a 28' x 46' rink, the right kit for you is the Iron Sleek 30' x 50' rink kit. If you want to build a 36' x 65' foot rink a 40' x 70' foot Iron Sleek Rink Kit is for you. Basically, the rink you want must be able to fit completely inside of the rink kit that you buy. This is definitely a case of bigger is better. A little extra liner is always a good thing. If you want to get started with something smaller, our Standard Box Kits are a great option. Since everything fits in one box, it ships efficiently and we price it right for you. The Box Kits come in 2 sizes, 20' x 20' and 20' x 46'. They are our best value and our best seller in both Canada and the US. You can easily upgrade your rink next year if you choose to expand. Iron Sleek was founded by two hockey fans who wanted to create a better way to set up a backyard rink. Kits at the time came with sub-par bracing and head-scratching instructions that elicited more groans than glee. Iron Sleek backyard rink kits are different. To start with, our brackets are 100% steel, not wood, plastic or aluminum, and have been specially designed by the Iron Sleek founders (who happen to be engineers). They withstand varying temperatures without cracking. They hold rigid in frozen soil and they can be used with lumber, plywood, or custom boards. This eliminates the need to find the exact right bracket size to meet the exact size lumber pieces you have on hand. The steel construction also means the brackets won't split as they are being hammered into the ground because they are strong, yet knife profiled. No more running to the hardware store mid-project! What could be better? How about installation? If this is your first time setting up a rink or you don't trust your abilities, contact Iron Sleek for a custom rink design and rendering. We also perform installs locally in the Chicagoland area and we have installers in select regions in Canada and the US. 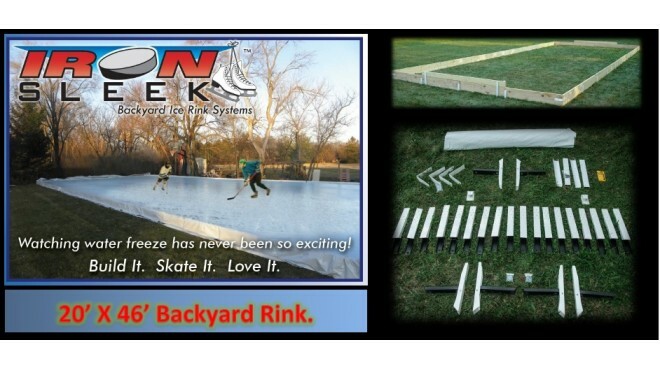 Watch some of our videos to see how simple it is to build a rink using our backyard rink kits. Our YouTube channel is very helpful tounderstanding how our rink components function. It's never too early to start planning backyard ice rinks! Iron Sleek components are compact and easy-to-store so you can order your kit any time during the year and have it ready to go as soon as the temperature drops. Start with a kit and then simply add components and brackets as needed to build your rink of dreams. 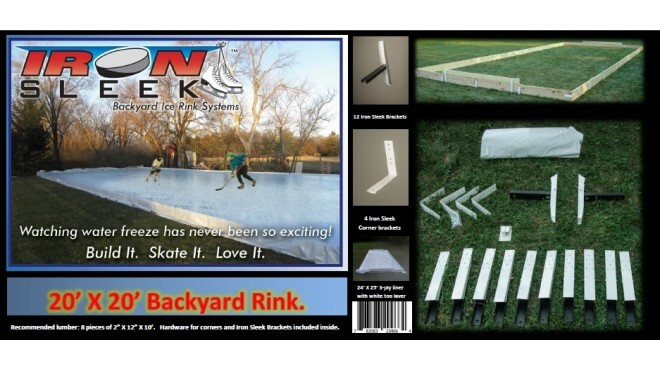 Shop for backyard hockey rink kits, liners, or individual components right now! Not sure what you need? Contact us at 877-825-2334. We'll be happy to discuss your site and make suggestions for your rink design and construction.